International tourism can be a lucrative business, prompting competition for visitors’ dollars. 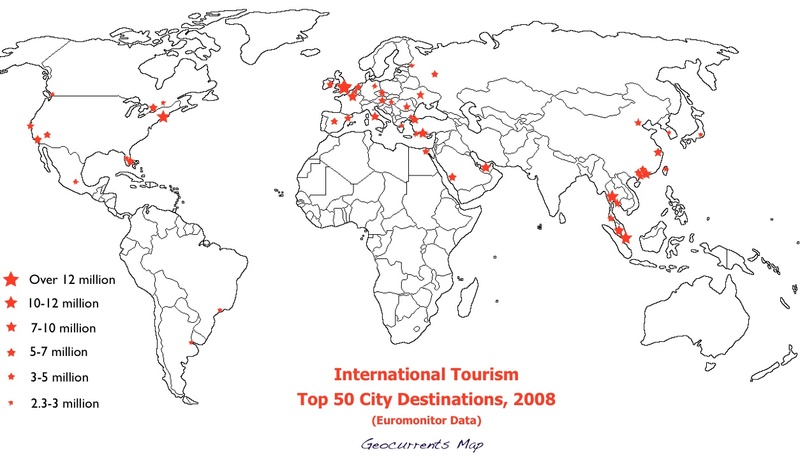 But as the map posted above indicates, the global tourism market is geographically focused. Most border-crossing vacationers head for three broad regions: Europe and the eastern Mediterranean; an arc stretching from Tokyo to Singapore; and coastal cities of North America. Only three Latin America locales—Mexico City, Rio de Janeiro, and Buenos Aires—make the top fifty list, and only by a thin margin. 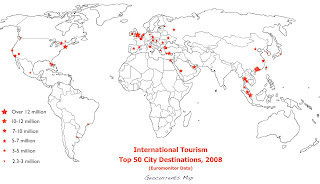 No South Asian or Central Asian cities appear (Delhi and Mumbai come in at 53rd and 55th respectively). Sub-Saharan Africa is not represented at all in the top 50, and only Johannesburg (67th) and Cape Town (82nd) make the top 100 destinations. The map, derived from Euromonitor data, contains some surprising information. Few people in the United States have heard of the southern Turkish city of Antalya, yet with more than eight million visitors in 2008 it ranked in the seventh position. Nor is Antalya the only popular tourist site in Turkey; Istanbul ranked tenth, Edirne (Adrianople) 45th, and the obscure Mugla 39th, surpassing Rio de Janeiro and Berlin. Equally unexpected is the strong showing of Bucharest, Romania. According to the Euromonitor data, Bucharest’s 3.1 million visitors in 2008 easily surpassed Athens’ 2.3 million, and far overshadowed the 1.7 million tourists who traveled to Florence. If any reader can explain Bucharest’s showing, please do so. On the eastern side of Eurasia, the biggest surprise is the strong draw of south China and Southeast Asia. Four cities in the Pearl River estuary make the list: Hong Kong, Macao, Guangzhou, and Shenzhen. Shenzhen, which did not exist before 1979, attracted more than three million visitors in 2008, barely trailing San Francisco. Thailand’s presence in international tourism is huge, with Bangkok ranked as the world’s third most visited city, trailing only London and New York, while Pattaya ranked 23rd, Phuket 31st, and Chieng Mai 78th. Further south, Kuala Lumpur (Malaysia) and Singapore ranked fifth and fourth respectively, besting both Paris and Dubai. A number of countries outside of the tourism mainstream hope to capture some of the rewards spread by free-spending visitors, and seek help from the UN to do so. On October 24, 2010, the United Nations World Tourism Organization (UNWTO) launched its annual meeting on Iran’s island of Kish in the Persian Gulf. Iranian officials expressed hope that the meeting would jump-start their country’s vacation trade. 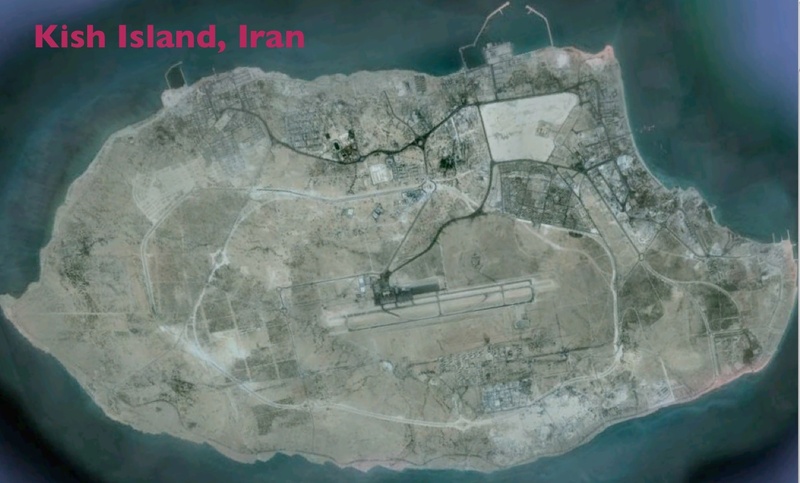 As Iran’s Press TV reported, “experts believe Iran has enough potential to turn its low-profit tourism sector to a lucrative source of income.” Kish Island, a free-trade zone, already attracts almost a million visitors a year. Its potential for further development, however, may be limited by the Tehran regime; the Wikipedia article on Kish is illustrated most prominently by a photograph of its “ex-casino.” But Iran’s short-term prospects are probably better than those of another UNWTO conference participant, Zimbabwe. According to a recent article on a global travel site, tourism is poised to act as “an accelerator for recovery for Zimbabwe,” owing largely to the fact that the country just “secured a seat on the United Nations World Tourism Organization (UNWTO) Executive Council.”Considering the current state of Zimbabwe’s politics and economy, such thinking may be a tad wishful.